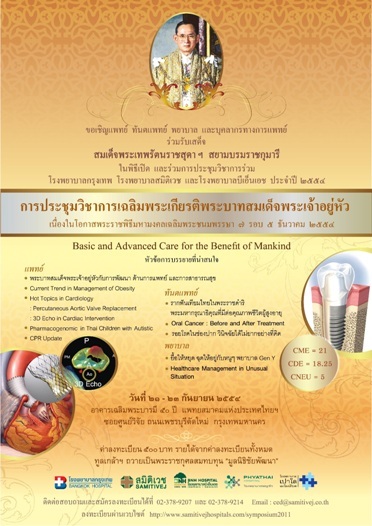 � A keynote speech on �His Majesty the King and Thailand�s Medical and Healthcare Development� by Prof. Emeritus. Dr. Kasem Watanachai, MD, a Privy Councilor. 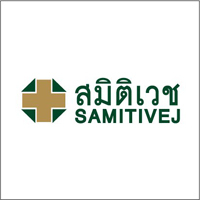 � A keynote speech on �Thailand�s Medical and Healthcare in ASEAN Liberalized Market Context� by Dr. Chatree Duangnet, Bangkok Hospital�s CEO, and Mr. Raymond Chong, Samitivej�s CEO and Managing Director. � Technical update on new information and interesting researches related to various specific and most frequently found diseases, such as problems in Autistic & ADD children by Prof. Dr. Penkhae Limsila, a specialist in Autistic and ADD, and Dr. Cholpatr Sookkasem. � Presentation and discussion on new state-of-the-art technologies that help increase accuracy in diagnosis and treatment of various diseases while reducing pain and time to recover. Interested persons may register at 0 2378 9214 or email ced@samitivej.co.th with Bt500 fee per seat. All proceeds from the registration will be presented to HM the King for use in the Chaipattana Foundation.